'Internationally exhibiting artist Dianne Bos references a famous World War I poem for the title of this exhibition of extraordinary photographs taken in ‘no-man’s land’ between the trenches on the Western Front. Traveling through France and Belgium from 2014 to 2016, Bos used a variety of vintage and pinhole cameras to photograph the land a century after the Great War. Bos then incorporated objects from the battle sites – such as rocks, leaves, and a bullet – in the darkroom printing process. By scattering these over the paper during printing, as well as dodging, burning, and overlaying maps of stars, she produces layers of imagery that convey the emotional depth of these extraordinary landscapes. As Bos says, these works “make the invisible visible” and explore how a terrible historical event has become part of the fabric of our collective imagination. Dianne Bos was born in Hamilton, Ontario, and received her B.F.A. from Mount Allison University in Sackville, New Brunswick. She was the founder and programmer of the Exposure Photography Festival from 2004-2012 and divides her time between the foothills of the Rockies and the Pyrenees. She has been the recipient of many awards and grants including the Canada Council for the Arts and the Alberta Foundation for the Arts. 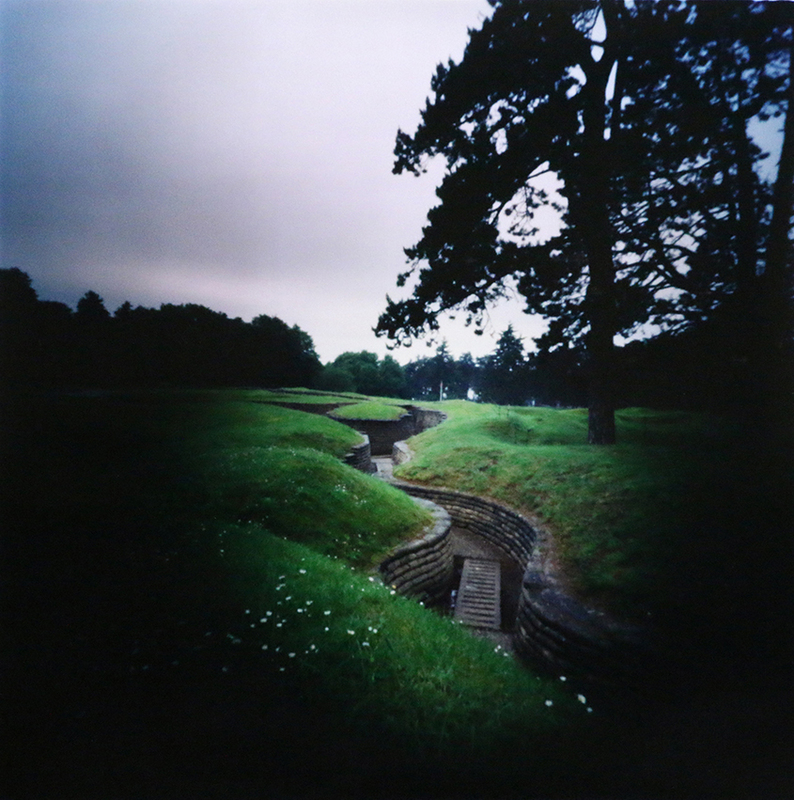 Dianne Bos, Trenches, Canadian National Vimy Memorial, Vimy, France (detail), 2014, Chromogenic print. Photo: courtesy of the artist.